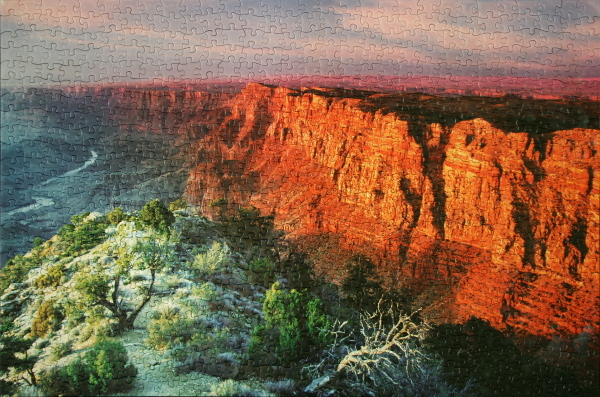 Puzzles Puzzle: Grand Canyon, Arizona, U.S.A. Puzzle: A beautiful puzzle, a pleasure to do. Might be a little challenging for a beginner, due to the large areas of orange rock. The sky is only 4 pieces deep, with a clearly defined bottom boundary with the rock, the sea area is well-defined with two arc shapes of foam dividing it into easily-managed gradient-coloured regions. The trees at the bottom right and the top of the orange rock are darker than almost anything else in the puzzle. All these regions are good places to start. The bright green trees help split the bottom left region into separate areas. The white gnarled tree in the bottom right quarter is also quite distinct. That leaves the orange rock and the white ground with trees in the lower left quarter, and a few areas of colour fading between already-completed regions. Notes: I have completed quite a few puzzles depicting the Grand Canyon so far. landscape, puzzle, tree, USA, water. Bookmark.